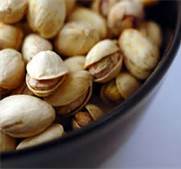 Torn and Glasser, Inc a Los Angeles, company is voluntarily recalling some packaged Pistachios because it has the potential to be contaminated with Salmonella. This recall has been classified as a Class I recall due to the potential of contamination with Salmonella. The Torn and Glasser recalled products contain pistachios supplied by the ARO processing plant located in Terra Bella CA. Salmonella can cause serious and sometimes fatal infections in young children, frail or elderly people, and others with weakened immune systems. Healthy persons infected with Salmonella often experience fever, diarrhea (which may be bloody), nausea, vomiting and abdominal pain. In rare circumstances, infection with Salmonella can result in the organism getting into the bloodstream and producing more severe illnesses such as arterial infections (i.e., infected aneurysms), endocarditis and arthritis. 460-120 Torn and Glasser label PISTACHIOS NATURAL, Roasted and Salted 24/8 oz bags 0 72488 15002 7 Lot code: 3402. Lot code marking can be found on the front label. H460-084 Hilo LabelPISTACHIOS NATURAL, Roasted and Salted 12/1 LB bag 0 72488 11209 4 Lot code: 0923. Lot code marking can be found on the back corner next to the seal. 460-123 Sun Harvest LabelPISTACHIOS NATURAL, Roasted and Salted 24/12 oz Bag 6 46670 30675 4 Best Before Date:04/11/2013 JD:1003 & Best Before Date 04/23/2013 JD:1133. Lot code marking can be found on the back corner next to the seal. Roasted and Salted 10 LB Case (12 BAGS) 2 06620 xxxxx x Best Before Date:02/20/2013 JD:0513 & Best Before Date: 02/25/2013 JD:0563 Lot code marking can be found on the front label. ← FDA sets limits on arsenic levels in apple juice, seeking recommendations.